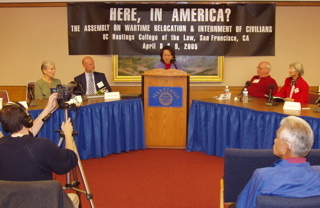 “The Assembly on Wartime Relocation and Internment of Civilians” was held April 8 and 9, 2005, at Hastings College of the Law in San Francisco, California. This public testimonial event highlighted the wartime experiences of immigrants of German, Italian, and Japanese ancestry in the U.S. and from Latin America who were classified as “enemy aliens” during World War II. Muslim, Arab and South Asian American witnesses also spoke regarding the importance of education and dialogue about issues and lessons from the past which resonate today.